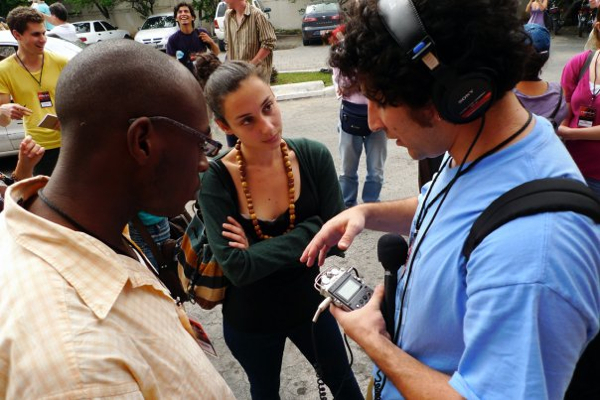 —I’ve conducted training sessions for Free Speech Radio News in Mexico, Bolivia, Mississippi, Portland, and New Orleans (click here to read an article I wrote about the training in New Orleans. —Working for the Radio and Television News Directors Foundation, I taught one-day intensive trainings for youth at the National Federation of Community Broadcasters (NFCB) conferences in 2004 & 2005. —I’ve been a professor at the Narco News School of Authentic Journalism in 2004, 2010, and 2011–part of a team of journalists sharing knowledge about both radio production and journalism in general. —I’ve trained people of all ages in radio production in Algeria, Spain, the desert of southern Jordan, and beyond…. —Part of my current job at Making Contact is training interns and volunteers in how to produce a radio story from start to finish. This includes not only the technical skills, but also how to conceptualize and execute a radio piece: everything from choosing interview subjects, to storytelling, script writing, and how to use ambient sound.